Preheat the oven to 180ºC/350°F. In a bowl thoroughly combine all the ingredients together and form balls. Place them in a single layer on a baking tray in the oven and bake for 15 mins or until firm to touch. Dried Shrimp Sauce: In a medium pan, heat the palm oil for about 5 minutes. In the mean time blend the pepper and onion, add it to the pan of heated oil with garlic and ginger. Allow to fry for 10 minutes then add the shrimp, chilli powder and Knorr cube. Fry until all the liquid has evaporated. Thank you African Foods. 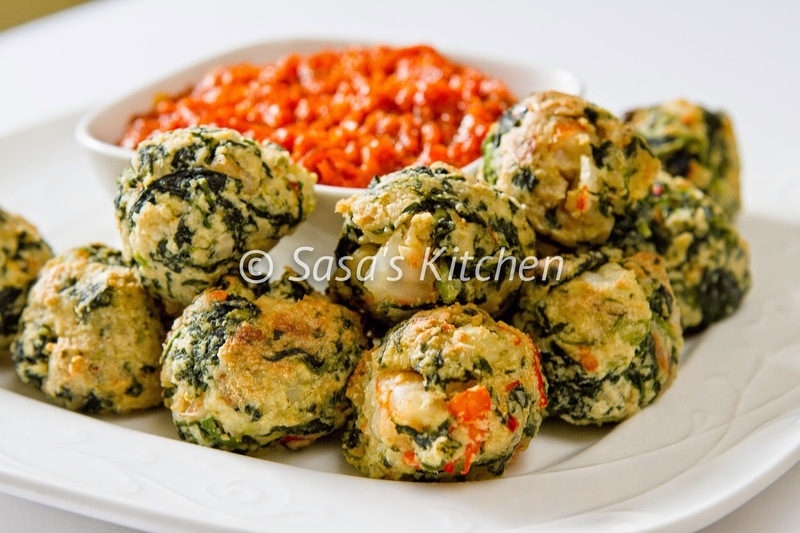 You can also go to sasaskitchen.com for more yummy recipes.